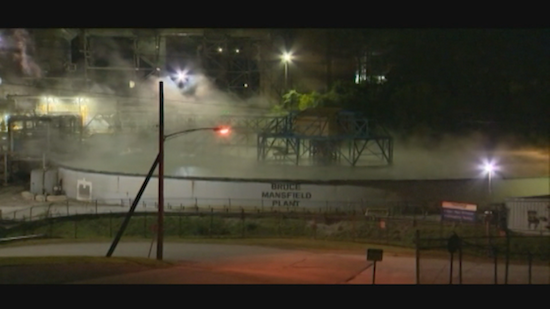 Two contractors working on a pipe in an underground pit at the western Pennsylvania power plant died when the pipe ruptured, releasing toxic fumes. Three other workers above the pit were overcome by some kind of fumes released by the leak and taken to hospitals. Two contractors died after inhaling toxic fumes that also injured three other workers in an underground pit at a western Pennsylvania power plant early Wednesday morning. Police said the Enerfab Corp. workers were in a “confined, well-type” area at the Bruce Mansfield Power Station in Beaver County, PA, shortly before 1 a.m. Wednesday when they removed an elbow joint in a pipe, releasing hydrogen sulfide gas into the air in the confined space. Police said 34-year-old Kevin Bachner and 42-year-old John Gorchock, both of Pittsburgh, were unable to make it out of the well and died. Three other workers — identified by police as Mark Wagner, 31, of Pulaski, Thomas Cantwell, 31, of Crafton, and Michael Gorchock, 43, of Pittsburgh — were taken to area hospitals. The plant in Shippingport, about 35 miles northwest of Pittsburgh, is FirstEnergy’s largest coal-fired plant. FirstEnergy spokeswoman Stephanie Walton says the plant remains operational.